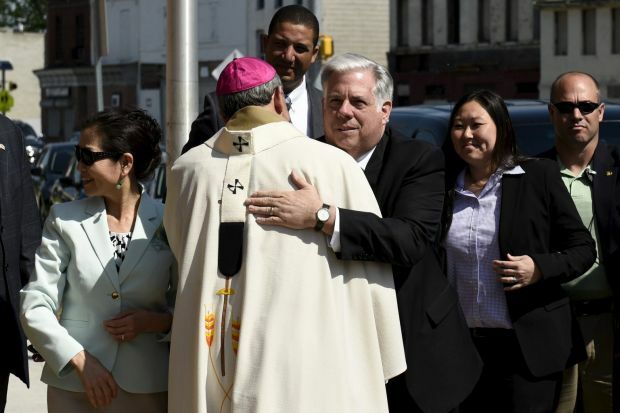 BALTIMORE (CNS) — Prayer provides the strength and patience needed to love neighbors and will help Baltimoreans as they addresses the injustices that led to a night of rioting and looting, Archbishop William E. Lori of Baltimore said. “Given my occupation, I think it’s important to start every occasion this way,” Archbishop Lori said in response to a reporter’s question May 3, which was designated by Maryland Gov. Lawrence J. Hogan Jr. as a day of prayer and peace for Baltimore’s healing. The calls for prayer followed hours of rioting and looting the night of April 27-28 that rocked West Baltimore. The violence came in response to the death of Freddie Gray, who died April 19, a week after he was seriously injured while in police custody. Joined by Hogan, his wife, Yumi, parishioners and a dozen news crews, Archbishop Lori celebrated the day with a special Mass at St. Peter Claver Parish, located in Baltimore’s Sandtown-Winchester neighborhood, where Gray lived, and which was the center of the violence. Residents and parishioners were hopeful that change was in motion. Auxiliary Bishop Denis J. Madden celebrated Mass at St. Gregory the Great Parish, located near where Gray was initially arrested. At 5:15 p.m. Mass May 2 at St. John the Evangelist Parish in Severna Park south of the city, Father Marc Lanoue, associate pastor, connected the fear referenced in Acts 9:26-31, the first reading of the day, to the situation. “We can’t always be in control, so we become fearful,” Father Lanoue said. The accountability for which the people of Baltimore are asking “is an accountability we must demand of ourselves,” he said. As parishes prayed for peace and justice, Archbishop Lori noted in his homily that St. Peter Claver’s own pastor, Josephite Father Ray Bomberger, has been involved in that effort since the outset. Traveling through West Baltimore April 28, the morning after the violence, Archbishop Lori said that Father Bomberger was not to be found on the parish grounds. “It is the sum of people’s injustice or indifference that ends up creating a society where it is difficult, almost impossible, for so many people to flourish — to lead lives that are happy, productive and secure,” Archbishop Lori said. At the conclusion of Mass, Raymond Kelly, a member of the St. Peter Claver pastoral council as well as president of the community group No Boundaries Coalition, noted the massive response of volunteers to the stricken area immediately following April 27. After Mass, Hogan told reporters noted that the 3,000 National Guard soldiers in Baltimore were in the process of leaving the city. “There are so many good residents, so much knowledge, so much expertise, and so much desire to make things right,” he said. Zygmont writes for the Catholic Review, newspaper of the Archdiocese of Baltimore. The archbishop also said that Gray’s death — which has since resulted in charges filed against six Baltimore police officers — indicated the presence of “structural sin.” What does that mean?